Originally on grey marbled colour vinyl. Some grey copies play with dissonance due to the hole not being exactly in the center of the vinyl. Both records are housed in a transparent gatefold PVC bag, square to one side and rotund to the other side. Bootleged in 2004 on dark blue transparent vinyl. B3 incorrectly credited to Eevo Lute. Hello all, got this when it was released, i was lucky in that my copy plays perfectly. 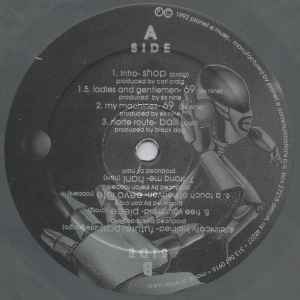 This record was so ahead of its time when released, there s a funny story about how one of drum n bass founders,cant remember who,played Bug in the Bassbin at 45 and that was one of the influences kicking off that music style.For me at the time it was awesome,no one was making music like that at the time, still love this record today, 2017,and will always be a fav. "never took off as a DJ" ?! what are you talking about ?! I've seen him many a time over the years and he's always delivered. original pressing was on grey marbled vinyl,blue was a later issue.the shop 12"/bug in the bass bin originally came out on black vinyl accompanied with an a4 sheet of information,the coloured pressings were later issues.